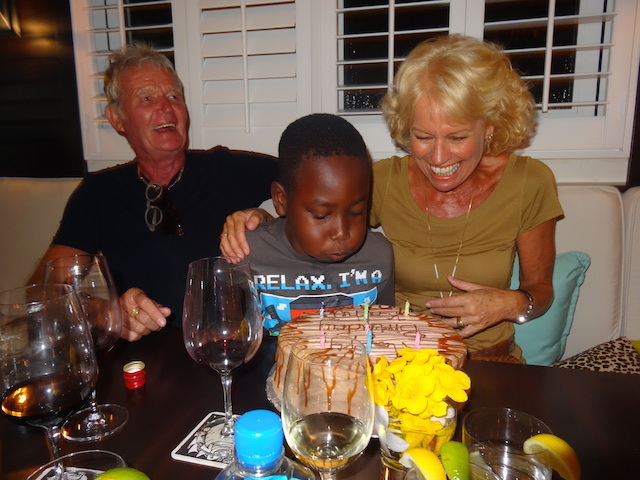 This week we have been celebrating a birthday in Governors Harbour Eleuthera- mine ! I know that plenty of people do not share my enthusiasm for celebrating their own birthdays – but I have always found it a joy and a reason to bring out the bunting. For me and my two sisters birthdays have always been a joyous celebration. From being very small our parents bought us up believing that your birthday was a special day for you – nothing to do with presents although of course we did love that part as well. It was about being made to feel special and treasured – I always say you can do no wrong on your birthday. It is about feeling cherished and remembered and having fun as well……. So Monday started with breakfast in bed , followed by a good hour’s reading of a great book – All The Light We Cannot See by Anthony Doerr- I had of course given myself the day off ! Then a walk on the beach – at 10.30 on a Monday morning !!!!! Stopping to chat with a couple of people we met along the way – absolutely no rush at all …… French Leave Beach is my choice for walking – about an hour’s walk from one end to the other followed by a little floundering in the water – nothing better. Then a light lunch at Da Perk cafe in the harbour – eggs benedict with smoked salmon – well it was my birthday. The lovely Cleaomie doing her thing ! A little relaxation and another hour of reading then it was time for an at home pedicure with the lovely Cleaomie Rankine of Concierge Massage Therapy. My sister and I sat side by side soaking our feet and being pampered by Cleaomie. Then I suddenly had a brainwave – in the freezer there were some Haagen Dazs chocolate ice creams I has recently stocked up on from Tracey Knowles at Norma’s Gift Shop – made for the occasion , so we tucked in ! Feet all finished and feeling great ! After sitting for some time allowing the nail polish to harden – very important ! – it was time to get ready and go off for a family celebration dinner at 1648. So tasty – Lobster Thermidor ….. Many of you know how much I enjoy the food here and Monday night was no exception. We shared several appetizers and then I ate a fabulous lobster thermidor. I say I ate it in memory of my late stepfather Theo Pattison who just LOVED lobster thermidor – but it was for both of us ! Other choices were filet mignon, seafood risotto and pizza…. This was followed by a scrumptious chocolate birthday cake complete with candles and everybody singing – such a treat……… Thank you Merez and team for the cake ! So a day filled with love and joy – and being made to feel cherished – that is what a birthday should be – and just in case any of you wanted to know – I was 62 ! Great to feel healthy and happy as each year goes by. I hope your next birthday is filled with joy as well….. And thank you so much to all those who sent birthday greetings on Facebook – and thank you to Facebook for reminding our friends when our birthdays are – so helpful….. I hope you read my recent email wishing you that Happy Birthday! We are not on Facebook. I wanted to tell you that I have been enjoying your blogs very much. Happy belated birthday, I do not know exactly when it is but I have always felt that birthdays are special and should be treated as such. My family always celebrated and made one feel especially special on their day. So pleased to hear that you a) enjoy the blog and b) enjoy special birthdays as well…..
What a wonderful to celebrate your birthday! Happy Birthday and many more! Thank you – I am doing ! My wife’s birthday was aug 17 as well. However it is worth more than my life to expose which one. Cheers! Very happy you had a lovely day. Another sunny Leo ! Hope she had a happy day as well….